As stated, above, you =MUST= have a Full-4 Merged install, or at the VERY LEAST SF2:E to make use of this mod package, as it references all stock items for the aircraft and cockpit ONLY found in SF2E or Full4 Merged game installs. If you have neither of these, don't download this, as you'll not be able to use it. 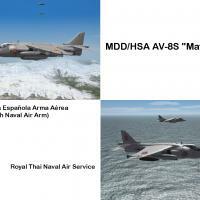 As as extra added surprise bonus, a skin/decal pak for the Royal Thai Navy Harriers is included as well (all 8 of them!). New serials and individual markings were created; all others are stock 3W decals (insignia, finflash) from the game's objectcats.